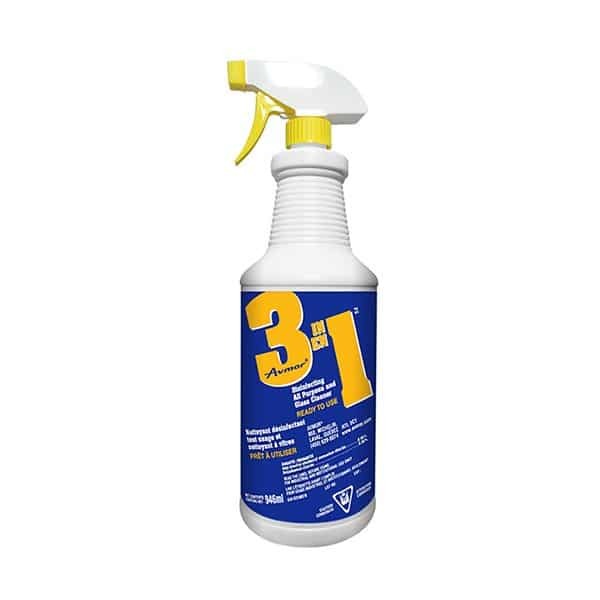 3 IN 1 Disinfecting All Purpose and Glass Cleaner is a versatile disinfectant that effectively cleans all hard surfaces with food related grease, dirt, and other common soils. An optimum blend of disinfecting agents and surfactants enables this product to also clean glass and Plexiglas to a streak-free shine. 3 IN 1 is formulated to act as a proven disinfectant against common pathogenic bacteria and viruses. When used as directed 3 IN 1 is effective against: Staphylococcus aureus, Salmonella choleraesuis, Pseudomonas aeruginosa, Salmonella typhosa, Pathogenic fungi such as: Trichophyton interdigitale, Escherichia coli, Brevibacterium ammoniagenes, Klebsiella pneumoniae and Influenza A2, Herpes simplex, Adenovirus type II, and Vaccinia viruses. 3 IN 1 Disinfecting All Purpose and Glass Cleaner is not limited to cleaning food service establishments, but is also useful as a general-purpose cleaner in commercial buildings including offices, stores, and washrooms. As a powerful disinfectant cleaner, 3 IN 1 Disinfecting All Purpose and Glass Cleaner can be equally effective for fast clean-ups in hospitals and institutional environments. Avmor 3 IN 1 Disinfecting All-Purpose and Glass Cleaner is only available in the convenient ready-to-use format. No dilution is required. NON-POROUS SURFACES: Stainless steel, plastic, metal, tiles, glass, painted walls (always test prior to use). 1. Spray 15-30 cm from surface or directly on cloth. 2. Wipe with paper towel or cloth. For food contact surfaces, rinse with potable water. 1. Pre-clean surface as per cleaning directions described above. 2. Thoroughly re-wet surface, leave for 10 minutes. 3. Wipe with paper towel or cloth. For food contact surfaces, rinse with potable water.